T-Mobile US introduced the LG G-Slate tablet over a month ago, but we got the first details and pictures just recently. Today we have an even better thing for you – a hands-on video. The Tegra2-based G-Slate will be called Optimus Pad outside the States, but the specs stay the same. LG Optimus Pad runs on Android 3.0 Honeycomb and packs a 8.9-inch 3D display, 32GB internal storage and two cameras (5 megapixel and a smaller 2 megapixel one) that combined can capture 3D stereoscopic 1080p video recordings. There’s a Single LED flash and all-round connectivity package. 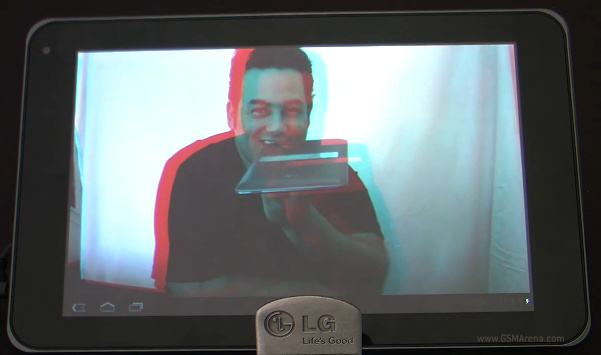 Unfortunately, to watch 3D content on the G-Slate you’ll need to use 3D glasses. A pair of the glasses will be provided with the device. It was just yesterday we reviewed the LG Optimus 2X and I have to admit the Optimus Pad looks much like an oversized Optimus 2X. That’s not bad at all, the oversized iPod Touch, called iPad, has been selling in millions. The T-Mobile US headed G-Slate should become available this spring, so I guess the international Optimus Pad will hit the shelves about the same time.